This recipe is reprinted from my book The Easy Cannabis Cookbook (2018, Rockridge Press) that contains over 60 easy medicated recipes for both sweet and savory favorites. 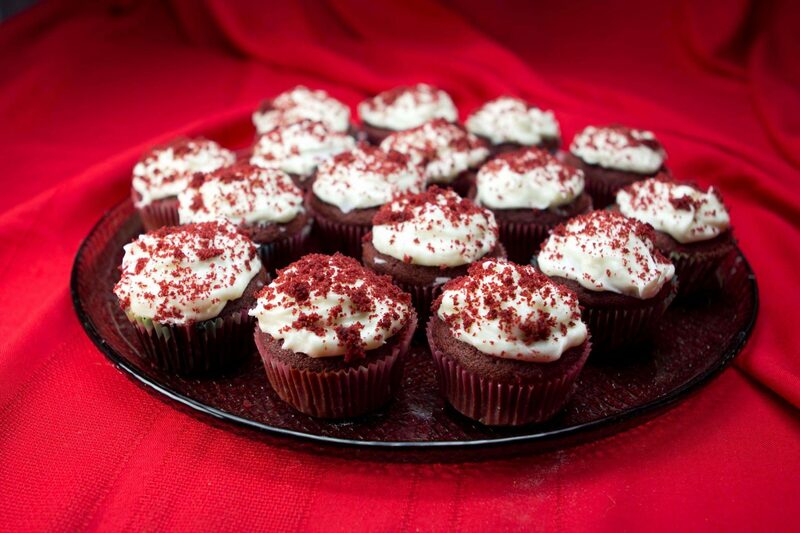 Because of its dramatic look, red velvet cake always elicits wows from guests, and this cupcake version is no exception. I use Marijuana Oilto medicate this recipe. MyMaking Marijuana Oil tutorial will help you learn how to make it. 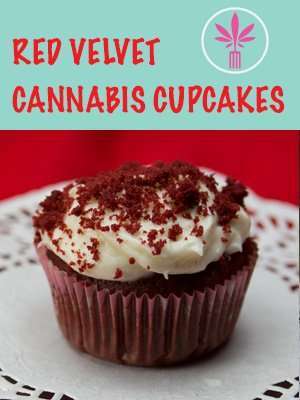 Each cupcake will have about 25 mg THC per serving IF you made your marijuana oil from average cannabis (10% THC) and used 1/2 ounce of marijuana to make 1 cup oil. To adjust the dosage for your personal needs and to reflect the strength of the marijuana you are cooking with and the amounts you used to make your oil, be sure to take my FREE 10 minute online Dosing Class that will teach you how to use the handy dosage calculator tool on this page. Preheat oven to 350 degrees F. Line 24 muffin cups with paper cupcake liners. In a large bowl beat together the cannabis oil, buttermilk, eggs, food coloring, vinegar, and 1 teaspoon vanilla extract with an electric mixer. In a medium bowl, stir together flour, sugar, baking soda, salt, and cocoa powder. Add the dry ingredients to the mixer bowl and mix just until smooth. Divide batter among prepared muffin cups, filling each about 2/3 full. Bake until a toothpick inserted in the center of a cake comes out clean, about 20 minutes. Cool completely before frosting. 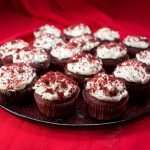 To prepare icing, beat together cream cheese, butter, and 1 teaspoon vanilla extract with an electric mixer until light and fluffy. Lower mixer speed and slowly beat in confectioners’ sugar until incorporated. Increase speed and beat until frosting is light and fluffy. Spread icing over completely cooled cupcakes, leaving a small rim unfrosted to allow the cake to peak through. 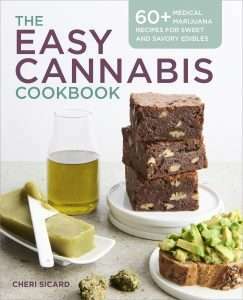 For more easy to make marijuana recipes, be sure to check out The Easy Cannabis Cookbook by Cheri Sicard (2018, Callisto Media).